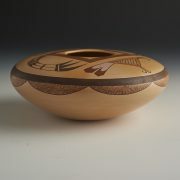 Jody has always had the ability to create a stunning, plain polished elegant bowl. She uses an asymmetrical opening which enhances the beauty of the non-decorated surface. The polishing and the firing are so terrific, that the bowl seems to glisten. Made in 2000, this is a perfect example of Jody’s simple and elegant form. Understated and beautiful. Jody Folwell is one of the most important innovators of our time. She experiments with abstraction, composition, movement, themes and textures. 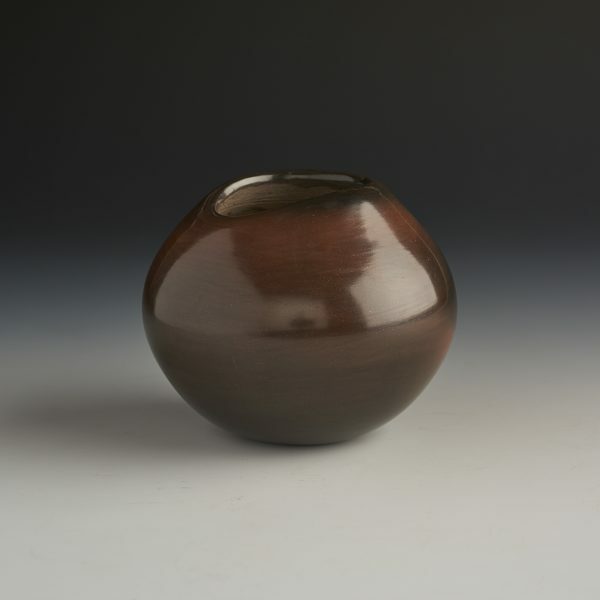 Because of her work with different slips and firing techniques, her polished pieces take on different colors, shades, and textures all within the same piece of pottery. For those of us who have become interested in contemporary pueblo ceramics, the importance of Jody Folwell is now a matter of record. 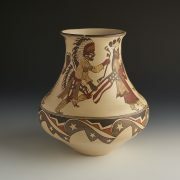 Her courageous deviations form the traditions of her time are an inspiration for other potters for years to come.